We are a group of dedicated black and tan lovers with the common goal of raising funds for deserving projects. So far, we have raised over $5,000 for events and causes like: The AMTC/CMTC Juvenile Cardiomyopathy Study; The ETT (Black and Tan) Club's Health Grants; and the British Manchester Terrier Club's 75th Anniversary Celebrations. We are also professionals. In addition to extensive experience in the publishing and design industries, our team also includes long-time breeders and handlers. We know first-hand what you are looking for in an advertisement and in a magazine! We currently have an opening for a Distribution Manager -- email Amanda for more information. Amanda began competing in Junior Handling with her family's Toy Manchester Terriers more than 25 years ago and today breeds TMTs with her mother, Wendy, under the Fwaggle prefix. Over more than two decades, the Kelly's have produced many of North America's top Toy Manchesters including multiple Best In Show and Specialty winners as well as dogs titled in numerous performance sports. Professionally, Amanda is a Public Relations practitioner for the Canadian government. Her publishing experience includes two years as Editor of Canine Review magazine and almost two decades as a writer for numerous North American niche and all-breed magazines. Dawn lives in south-west England close to the sea, open moorland, woods, rivers and lakes; all perfect dog walking country. Her dogs are all much loved pets, adding to the noise and confusion of an already busy family home. Dawn studied applied science, business management and animal husbandry at agricultural college which she has put to good use in an equally interesting and varied career. 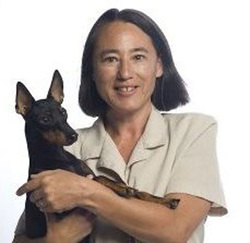 Researching the pedigree of her first English Toy Terrier led to three continents, which triggered a passion for the history of Black and Tans that has not diminished yet, and she has edited the English Toy Terrier (Black and Tan) Club magazine, Thumbprints, since 2009. Dawn exhibits and breeds English Toy Terriers with her husband, Pete, under the Appletor prefix and loves the fact that this breed can be out running on the beach one day and winning in the show-ring the next. 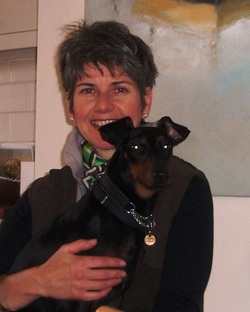 Leonie first discovered the Manchester Terrier while visiting Battersea Dogs Home in London in the 1980’s. There she found a little rescue dog; it was love at first sight and the beginning of a long association with the breed. Over the years, Leonie has enjoyed showing as well as supporting the British Manchester Terrier Club at numerous events including Discover Dogs and a number of British Game Fairs. Most recently she was one of a small team that developed and launched the first ever exhibition on the history of the Manchester Terrier at the Kennel Club in London. Professionally, Leonie worked for over twenty five years in the media, moving from magazine work to become an award-winning producer. However, dogs have always been a passion and Leonie is embarking on a new phase in her life and is shortly to qualify as a canine behaviourist. Melissa has always loved art and design, always loved dogs and loves that with the Black & Tan magazine she can bring her two passions together! Working as a graphic designer in both corporate and studio settings, Melissa has more than a decade of experience providing, strong impactful designs for top Canadian companies. Her work experience has enabled her to take a variety of projects from concept to production, including advertising, packaging and marketing collateral. 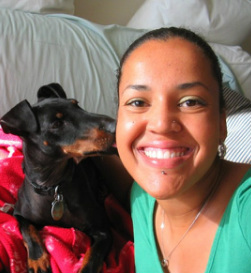 Melissa is owned by a 4-year-old Standard Manchester Terrier named Simba. The pair train in agility and love to be outdoors on hikes and leash-free dog parks. Simba is also a member of the Toronto dog sport demo team, Fast n' Furry. Aiko became involved in dog-related activities in 2007 with the purchase of her first show dog, a Toy Manchester Terriers named "Astar". Since then, she has learned to train and show dogs and has also bred a few litters, finishing her first bred-by champion in 2010. Professionally, Aiko learned the value of making client relationships a priority through her work with sales teams at several Fortune 500 companies. She is pleased to promote the Black & Tan and looks forward to working with advertisers to ensure they are pleased with their ad and their experience with the magazine. 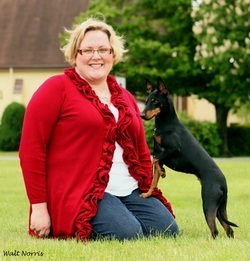 Dianna began exhibiting dogs in 1991 and fell in love with the Manchester Terrier in the early 2000s after adopting a Manchester rescue. She began exhibiting again in 2009 and, along with her husband Mike, now breeds and show Toy Manchesters under the Bayside prefix. The proud owner of several top winning dogs, Dianna has also achieved early success in the whelping box with 6 new champions from her first two litters alone! Professionally, she is a manager for two Pape’s Hyster forklift dealerships in California. She is excited to donate her time to help with Black & Tan because of its commitment to raising money for our beloved breed and looks forward to working with advertisers!